The Michael Hillegas Chapter/NSDAR and the NCO Elemetary School made valentines in support of Congressman Shimkus’s project “Valentines for Heroes”. Ninety-five 2nd and 3rd graders made valentines for the soldiers. DAR members presented information about the military and the Flag of the United States of America. DAR members Shelia Albright, Veterans Chairman, Candy Evans, Flag Chairman, and Dolores Payne, Veterans Committee presented each child with a flag and valentine pencils. As the flags were handed out, the children shared what they knew about the military. Many of them had stories of family members that had served in the military. One young girl said that her mother had been in the military and that her father was currently stationed in South Korea. DAR appreciates the 2nd and 3rd grade teachers and thank them for all the effort they put out with these young children. They are second grade, Michelle Eisenhauer and Deon Hall; third grade, (Sharla Barton, not present today), Heather Smith and sub Christi Williams. 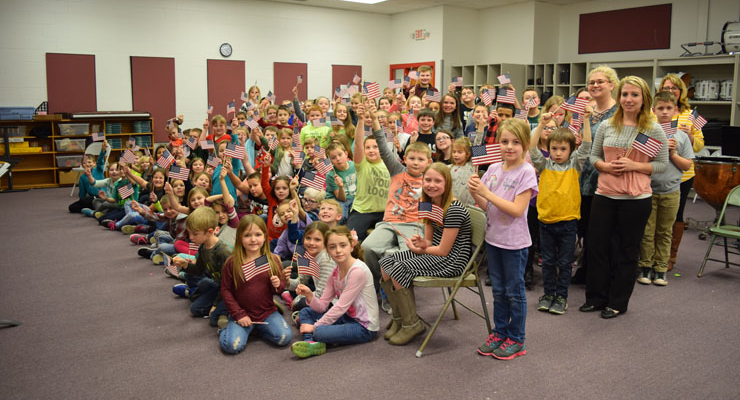 Thank you, NCO second and third graders, for supporting our military.